You may have heard of the Hermetic concept as above, so below. 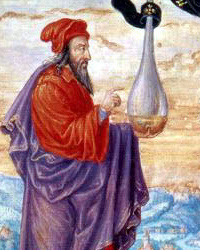 Hermetic writings in religion and philosphy are attributed to Hermes Trismegistus, an Egyptian magician and priest or sage. The Emerald Tablet of Hermes holds these writings, and there is another one The Emerald Tablet of Thoth. While many scholars consider Hermes and Thoth to be separate figures, others do not, but at some point all appear to unite them into the figure of Hermes Trimegistus (Hermes thrice great). As above, so below means, in essence, that the macrocosm is a reflection of the microcosm. That one is a symbol of the other. That if you know and understand one, you can know and understand the other. When we refer to as without, so within, it is essentially the same story. Whatever your outer life situation is (health, finances, love, family, profession, state of mind, success, etc. ), gives off a reflection of what is going on inside. Likewise, whatever is going on inside of you, reflects what is going on outside. This is quite important, as it can give you pertinent information in a way you might not have considered before. I remember when I was still quite a young woman, I had suddenly decided to change something quite noticeable about my hair. In a way, it was a liberating thing to do, a freer thing to do - hair-wise - than what I had done to that point. It was much more modern and perhaps even slightly out there. Thinking about it one day, I realized that the decision to do this to my hair had coincided more or less with a number of changes that had already taken place inside of me, on the same level, where my new attitude was somewhat more liberal and modern, and so what I had done with my hair, had merely been a symbolic manifestation of what had already taken place on an inner level. to... ....what?.. ... tell me please? the here and now is indeed one of the most important aspects of understanding why "without is as within". (If you haven't read it, check out Eckhart Tolle's The Power of Now"). Thanks Gabriella-I will do that!